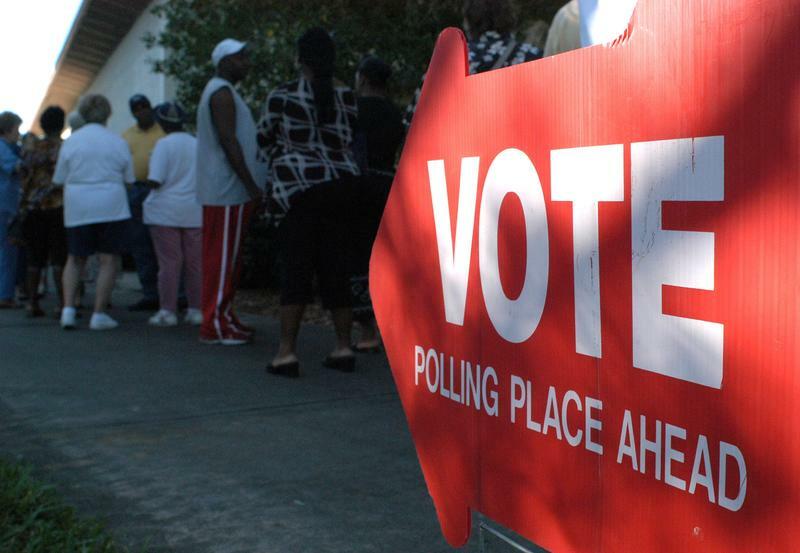 A sign points to voters lined up to cast their ballots at a polling place November 2, 2004 in St. Petersburg, Florida. BROOKE GLADSTONE: From WNYC in New York, this is On the Media. I'm Brooke Gladstone. Back in December, when we put together our Breaking News Consumer Handbook: Election Polling Edition, we warned against taking general election polls too seriously too early. A quick rehash: 1) Pay attention to which firm produced the poll. The five big ones that determine eligibility for the upcoming debates, which include the CBS New York Times Poll and Fox News, those employ live interviews and are, therefore, more reliable, but they’re also less frequent. In their absence, news outlets often draw upon automated and internet polls, which are much more likely to be untested, historically inaccurate and, on occasion, fake. Look at a bunch of polls and outlets that aggregate them because trends and averages matter most. MICHAEL COHEN: Says who? Says who? KEILAR: Polls. Most of them. All of them? KEILAR: Polls. I just told you. I answered your question. BOB GARFIELD: This exchange was duly noted by the quants over at FiveThirtyEight.com, Nate Silver's data journalism platform, where consolidating polling data is what they do. Senior Political Writer Harry Enten joins us, once again, to explain what “all of them” means, and what it doesn't. Harry? HARRY ENTEN: Well, what we know from the past is that candidates who were leading by the margin in which Hillary Clinton leads right now usually win. And, in fact, no one this far after the conventions has actually lost, since Harry Truman beat Thomas Dooley in 1940, and the polling technology back then was different. But the idea that someone can't close a margin that's at 6-1/2 percentage points isn't borne out in the past. You can look at the 1980 campaign, for example, where Ronald Reagan was basically tied with Jimmy Carter at this point and ended up winning by nearly 10 percentage points on Election Day. So these margins can close. BOB GARFIELD: One way they can close is if there’s some sort of scandal, some sort of October surprise that causes Hillary Clinton's campaign to implode. People are looking over their shoulders at the FBI's release of emails, over the next WikiLeaks disclosure. Is that the kind of event that can cause the gap to close very quickly? Any historical precedent for that? LYNDON BAINES JOHNSON: Good evening, my fellow Americans. LYNDON BAINES JOHNSON: I speak to you this evening about very important developments in our search for peace in Vietnam. HARRY ENTEN: As the Vietnam position of the Democratic Party became more dovish, there was a closing of the polls. And I think Donald Trump is hoping something similar will happen this year. Maybe it's the WikiLeaks, maybe it's the debate, but usually most single events don't have an impact. And this is why I often warn, be wary of the outlier and be careful of any momentary trend that you think you see in the polls. See if that trend still exists in a week or two. Remember, in 2012, for example, we saw after the first debate Romney come back in the polls and everyone was screaming, oh my God, this election’s a tossup. MALE CORRESPONDENT: New polls show the race completely up for grabs. MALE CORRESPONDENT: New ABC Washington Post polls shows the race is now at a dead heat. HARRY ENTEN: But, in fact, two, three weeks later we ended up pretty much exactly where we were pre-debates, which was Obama clearly leading. BOB GARFIELD: National polls seem to have the benefit of taking the temperature of the whole electorate, but you advise against putting too much stock in national polls. Why? HARRY ENTEN: There are two reasons why. Number one, obviously, the winner wins by winning the Electoral College, so you need to know who's winning in the individual states, though I should say, if someone's leading by, say, 6-1/2 points nationally, they’re probably going to win the Electoral College many more times than not. But, you know, who knows? Stranger things have happened. The other reason why is that we know historically, for whatever reason, the state polls, when aggregated together, in fact, give us a more accurate read of the election than the national polls do. Again, we can look back at 2012, for example. On Election Day when the state polls showed an overwhelming Electoral College victory for Barack Obama and the national polls showed a tighter Obama lead, it was the state polls that ended up being correct. BOB GARFIELD: So in our political environment, 42 of the state results are preordained. They’re going to be red or blue, and we know that already. This brings us to the swing states. Is that what FiveThirtyEight does, focus entirely on those swing states? HARRY ENTEN: Even if we believe that 40 or 42 of the states are already preordained, we can't be sure of that, especially in this election cycle where Donald Trump has upset the apple cart so many different ways. We are looking at all of the state polls, we’re aggregating them together and from those state polls we know whether or not the swing states are still the swing states and we’re then able to project out what's the chance that Donald Trump or Hillary Clinton is going to be able to win this election, based upon, mostly, the state polling. BOB GARFIELD: National and aggregated state polling results usually conform to the popular vote. The Electoral College and the popular vote are usually the same, but - not always? HARRY ENTEN: Not always. Even a young lad like myself remembers in 2000, for instance, when the state polling actually suggested that Al Gore was probably going to win. It was going to be a very tight race, though. And then the national polls suggested George W. Bush was going to win easily, and that was a case in which the state polls, again, were correct, mostly, while the national polls weren't. But the final result showed that the national winner didn't line up with the winner of the Electoral College. And that's why it's so important to look at the state polls, because in a lot of the red states Donald Trump still leads in the states that Mitt Romney won but by a smaller margin, and that has allowed the national polls, perhaps, to show a wider lead for Hillary Clinton, ‘cause she's doing better in those red states, but she's not running up the margin as much in the swing states, which is where this election will ultimately be decided. BOB GARFIELD: We’re trying to understand how to evaluate polling results as they’re reported in the press. Some polls measure the showdown between the Democratic and Republican nominees, others include the Green Party and the Libertarians. What do we do? HARRY ENTEN: Well, we are looking at the polls that include all of the party candidates because right now there is, in fact, a difference between the polls that include Gary Johnson and Jill Stein and those that don't. Donald Trump closes the margin a little bit on Hillary Clinton when you include all of the candidates. It’s a little bit more than a percentage point. Now, that doesn't matter so much right now, as Hillary Clinton holds a very large lead but if the race gets closer, it could get very interesting because you might get a signal from the polls that don't include Johnson and Stein that isn't confirmed by the polls that do. BOB GARFIELD: I read a recent piece - I think probably by you - and the most fascinating passage in it concerned the difference between closeness and certainty. We were constantly seeing this formulation at FiveThirtyEight and The New York Times, that there is an 88 or 90% probability that Clinton will prevail, but you're saying that large gaps, such as we’re seeing now between the candidates, may suggest volatility more than they suggest certainty. HARRY ENTEN: If you look at 2012, Obama had a very steady lead. This time around, remember, right after the Republican Convention, for instance, Donald Trump closed the gap significantly with Hillary Clinton, even led in some polls. So that’s one thing. She is still most likely going to win, but some days she leads by seven or eight where, in fact, a month ago that lead was in the low single digits and right after the conventions, it might have been in the high single digits. And what the model does is it takes that into account and says, you know what, this race may not be as over as the margin suggests it is. BOB GARFIELD: So even though Obama had only a 2% lead the day before Election Day in 2012, the Obamas would have been better advised to fit the Lincoln bedroom for drapes than the Clintons are today, even with this yawning 7% gap between her and Trump. HARRY ENTEN: Right. Barack Obama's polls were very consistent. People's votes were locked in. That's not as much the case this time around. There are a lot more undecideds, which gives Donald Trump an opening – it may be a small opening - that might allow him to climb back into this race and potentially win. BOB GARFIELD: Harry, thanks so much. BOB GARFIELD: Harry Enten is the senior political writer at FiveThirtyEight.com. 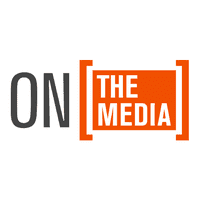 You can find the Breaking News Consumer Handbook: Election Polling Edition, Part 2 at our website, onthemedia.org. BROOKE GLADSTONE: Coming up, a dust-up over trigger warnings and safe spaces, and who’s really being coddled on campus?